George Graham Reviews Crooked Still's "Shaken by a Low Sound"
It's been said that all the good songs have already been written, and written a long time ago. Sometimes in listening to commercial pop music, one can be excused for believing that. There certainly are good songs being written these days, but after decades of dominance by singer-songwriters, the old traditional songs are being given a revival not seen since the folk music days of the 1950s and early 1960s. There have been dozens of worthwhile albums released by up-and-coming artists and well as by people who are already established and respected songwriters, consisting of traditional music. Bruce Springsteen, John Mellencamp, and Natalie Merchant have all dedicated whole albums to the old folk songs. This week we have yet another up-and-coming group whose debut album consists almost entirely of traditional or at least venerable material, performed in a distinctive style with a somewhat unconventional instrumental lineup. The group calls themselves Crooked Still, and their debut CD is called Shaken by a Low Sound. Crooked Still is a quartet based in the Boston area, which has been a hotbed for folk artists, especially singer-songwriters in recent years. Their instrumentation is a curious combination of cello, double bass and banjo. The members come from an academic background. Vocalist Aoife (pronounced "EEF-uh") O'Donovan and bassist Corey DiMario were classmates at the New England Conservatory of Music, pursuing classical studies, while cellist Rushad Eggleston attended the Berklee College of Music, known for their strong jazz program, on an academic scholarship. Rounding out the group is Gregory Lizst, who plays banjo with a four-fingered technique, and also holds a doctorate in biology from M.I.T. When he is not playing cello with Crooked Still, Eggleston also works with Darol Anger's Republic of Strings group. 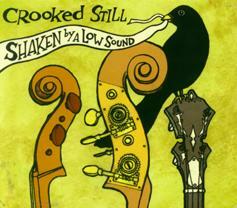 Crooked Still soon began attracting audiences first in Boston folk clubs, and then on the wider festival circuit, with their distinctive sound and creative approach to arranging old, familiar folk songs and spirituals. While their instruments are familiar, the combination with banjo and cello featured prominently, is both distinctive and pleasingly fresh. Ms. O'Donovan's excellent, and vaguely sultry vocals also add to the group's intriguing sound. They perform some of the most familiar of folk songs, such as Little Sadie, and Robert Johnson's, Come on in My Kitchen, and add some more obscure songs, as well as some more contemporary compositions such as one by Bob Dylan, and an original song. The CD was produced by San Francisco-based Lee Townshend, known for his work with eclectic jazz musicians such as Bill Frisell. There are some guest appearances by, among others, eclectic fiddler Casey Dressen, the Bay Area bluegrass duo Laurie Lewis and Tom Rozum, plus jazz drummer Scott Amendola from the Charlie Hunter group. But for the most part, the CD is by the self-contained guitar-less Crooked Still quartet. Shaken by a Low Sound, the new debut recording by the Boston area quartet Crooked Still, is another in a steady stream of new recordings dedicated to traditional songs. Crooked Still definitely adds a different touch to them, with their unconventional instrumentation of bass, cello and banjo, along with the wonderfully appealing vocals of Aoife O'Donovan. They apply a good deal of creativity to their arrangements -- partly out of necessity with their odd instrumental lineup -- and their choice of songs is a good one, from well-known folksongs, to material like the Bob Dylan tune. It's an impressive debut that further stretches the boundaries of traditional folk music. Our grade for sound quality is close to an "A." There is good clarity and a pleasing lack of studio effects, and the overall atmosphere of the recording has an intimate quality. The dynamic range, how well the recording preserves the differences between loud and soft passages, is fair. We could be seeing a bit of a repeat of the traditional folk music boom of the late 1950s and early 1960s, before the rise of the singer-songwriter. Crooked Still proves that the great old songs are very adaptable, while their creative treatments of those songs are very appealing.